We were so nervous, even though we had rehearsed and rehearsed, over and over. We knew the dance routine inside and out. We danced it umpteen times at the weekly dance class that we'd been attending for years. We also used the time that would be otherwise wasted as we danced it at the bus stop, as we walked down the street, and in the shower. Usually in our heads, but sometimes not! Especially if there were a few of us waiting on Fairview Strand to get the bus home from Monday night dance class at 10 pm at night! But this was an extra rehearsal, squeezed in the week before the big show, so much so that the only venue free was the portocabin in her back garden! So here we were. 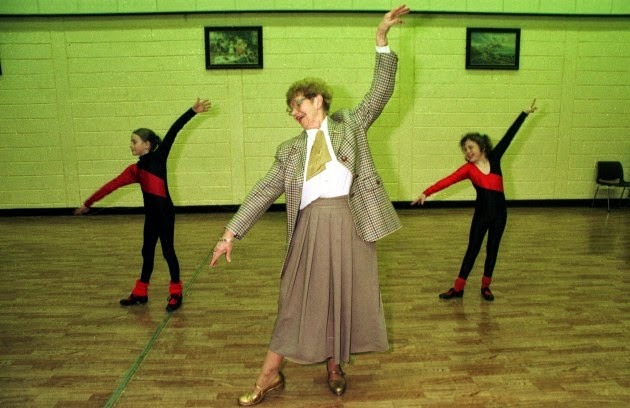 All 20 (approx) of us squeezed into this lady's 'dancocabin' - or Dance Studio as it would be dubbed these days! - with Lorraine once more putting us through our paces. This dance routine, all 7 minutes of it, had to be foot perfect, with every toe pointed throughout, as it was to be the finale number of this well known and respected lady's then biennial show. So we worked really hard as the routine was dissected, each section - especially the lifts, were tweaked to perfection and put neatly back together. Yet again. And then it was time. 'Mammy' was coming out to assess if we dancers would be acceptable for the finale number. The nervous adrenaline, the good type - the one that fuels your body to dance your little legs off - was palpable in the air as 'Mammy' entered. It was a small space and it seemed to expand so as to fit the aura of this awe-inspiring lady. Most of us had never been one of her 'kids' but were we to be now considered her 'seniors'? And so we put our nervous energy to good use that day in that extraordinary 'dancocabin', we plastered the smiles on our faces as the sweat dripped down our backs and gave the performance of our lives. It didn't matter that we didn't have the space, although we may have balked a tad when any of us made the front row and were practically face-to-face with her! - we just did the routine, lifts and tap section included. Full out. All 7 minutes of it. It was an amazingly choreographed routine that used every single beat of the music, and more. Miss Barry looked at us and nodded to Lorraine saying 'very good..... very good' She talked a little to us, thanked us too, and then she left. The legendary Billie Barry Stage School has been in the capable hands of her daughter Lorraine for some years now and the entertainment provided by the school's shows continues to be simply outstanding. I thoroughly enjoyed the two recent shows I went to see and really hope to go see their 50th anniversary, Golden Jubilee show 'Gold' next month. And so it was with great sadness that I heard of the death yesterday of this awe-inspiring, glamorous and legendary woman - Billie Barry. She gave much encouragement to every dancer or performer who came her way, and some rose to stardom or were led to a stage type career as a result of attending her school. May she rest peacefully, safe in the knowledge that her legacy will continue through her children and hopefully, in time, through her grand-children. I continue to think fondly of her and our stage experiences and my thoughts and prayers go to her whole family, but most especially to her daughters Joan and Lorraine. My love to you both, girls. @Looking for Blue Sky and @Older Mum: Thanks for your comments. I really appreciate them as I know dancing etc isn't yours, and most of my follower's, thing'. And thanks also for the likes and comments on Facebook.... I know you guys 'get it' having been through what I describe many times! I had to write this as it was an important and very enjoyable part of my life.... and part of me.